This past weekend we had the honor of working with Michael and Michelle Luu. Our journey with this couple started about 6 months ago. When we first met, we went over so many options for their wedding from linens and chair covers to draping and lighting. After several discussions, they decided on the items they wanted for their special day. Linens, chair covers, napkins, draping and lighting. The day came and our install crew headed over to Club Venetian in Madison Heights. I have to say that it has been more than 20 years since I was at this venue. I was met by Louie and several of his other team members. Louie was one of the nicest people I have met in a long time. He was super helpful with our staff and that made things so much easier. I cannot tell you how many times we have gone to venues and been treated like second class citizens when we are doing our jobs. Mental note: Aren’t we all here for the client? That’s why we are there. So I digress, back to the story. Club Venetian was super clean inside and out. Kudos to Louie and his team. We started off by setting out all the linens, then we moved on to the chair covers, draping and lighting. 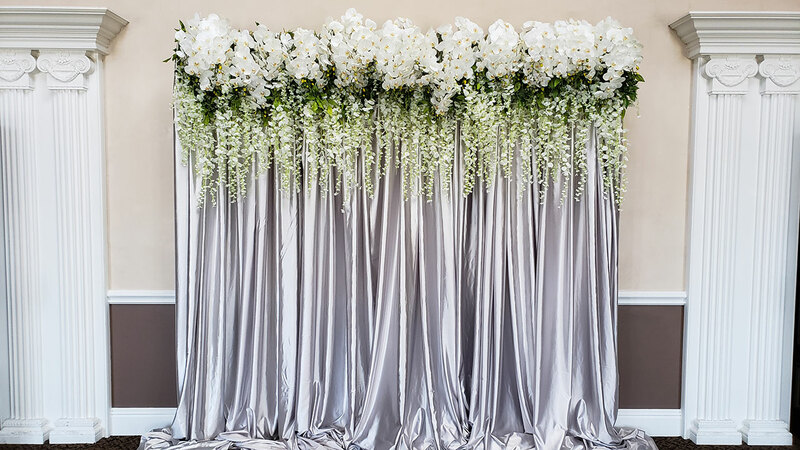 The draping was a triple layer backdrop with iridescent beads in the middle. 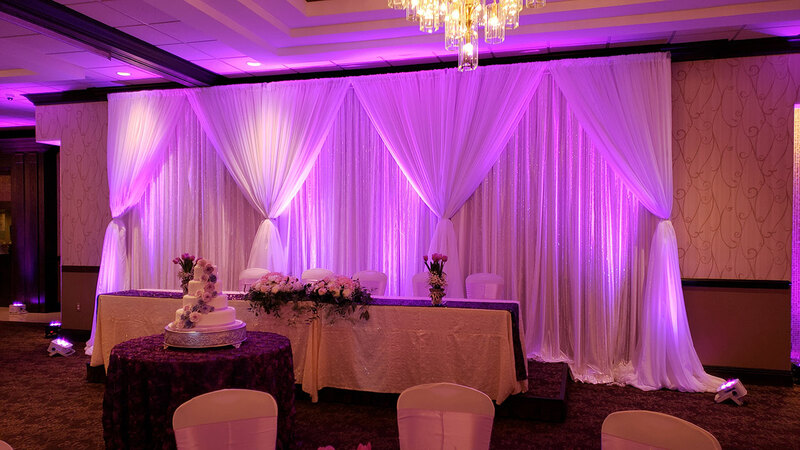 The bride and groom chose a purple tone for the lighting on the draping and throughout the room. For the tables, they chose a simple lilac classic solid table linen with our ivory majesty dinner napkin. 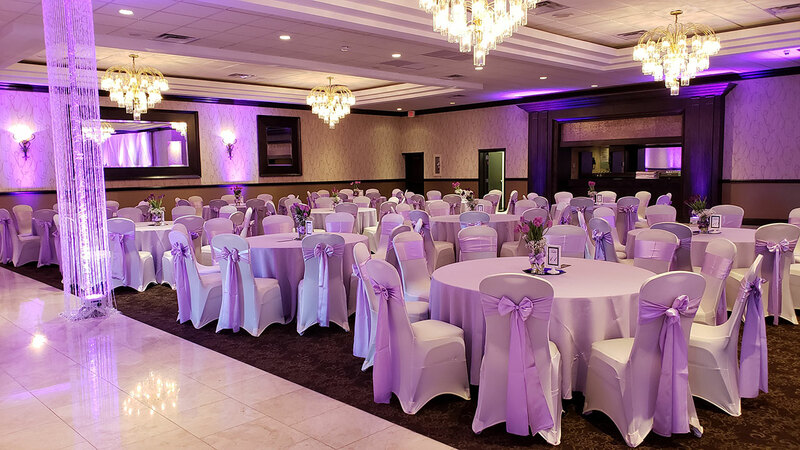 We covered the chairs with our ivory spandex chair covers with a lilac satin chair sash. For the entrance, the clients wanted a backdrop that they could use to take photos with family and friends. We set up a silver sateen backdrop with florals lined up across the top. Not only did this make a great backdrop, it made for a dramatic entrance. All in all, this was an amazing event. The sun was shining and the weather was beautiful. The clients had their dream reception and we had the opportunity to be part of it. We hope that this will inspire you and your event design. Take care and call us for your special day!